Copyright limitations and exceptions provide balance between users and creators of protected works. Copyright gives authors and creators exclusive ‘economic’ rights to exploit their works, for example to sell or copy them, as well as moral rights, such as to be named as the author, or to object to changes. In most countries, it is possible to give away these rights to publishers or other rights managers. Yet copyright is neither eternal nor universal. It is a temporary right, usually lasting for the life of the author plus a number of years. There are also legal flexibilities in copyright, known as limitations and exceptions, which are intended to promote access to, and use of, works. The goal is to find a balance between providing an incentive to create (and means of recouping the costs), and ensuring that others, including other authors and researchers, can use and build on these works. The work of libraries depends heavily on the sort of copyright rules in place in their country. Much attention is perhaps paid to the needs of academic and research libraries, who are involved in research copying, document supply, mass digitisation and text and data mining activities. However, it is also a serious issue for public and school libraries. Indeed, some of the most fundamental library activities – lending, supporting learning, preservation, are either difficult or impossible otherwise. Twin trends – towards globalisation and digitisation – have made the challenge acute. In a globalised world, researchers, students, and even ordinary citizens expect to be able to access information without being faced with national borders. Yet a WIPO study shows that libraries and archives work under a patchwork of provisions that differ in scope and effect from country to country, making cross-border working unnecessarily complicated. At the same time, the shift to digital formats has allowed a much greater degree of control over what libraries and their users can and cannot do with the materials to which they have access. This can threaten their traditional roles of providing access to knowledge and preserving our cultural and scientific heritage (Access and Preservation). The legal framework of copyright limitations and exceptions therefore needs to be updated to enable libraries to provide users with both historical and new services. The case for exceptions to copyright, as a means of ensuring that the monopoly rights granted by copyright do not work to the detriment of the public interest, is as strong as ever. Licences are not a cure-all solution either - many resources are not available, others only at a price which excludes a large share of the world's population from access. 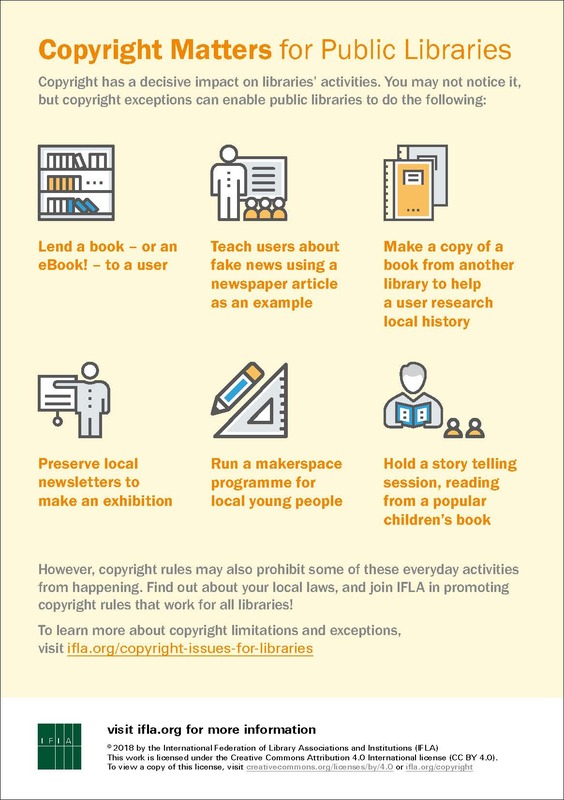 IFLA is therefore active at the World Intellectual Property Organization (WIPO), making the case for limitations and exceptions for libraries worldwide, as well as working with individual countries to promote change nationally. To find out more, keep an eye on the news pages of IFLA’s Advisory Committee on Copyright and other Legal Matters (CLM), the Library Policy and Advocacy blog, and follow us on Twitter. 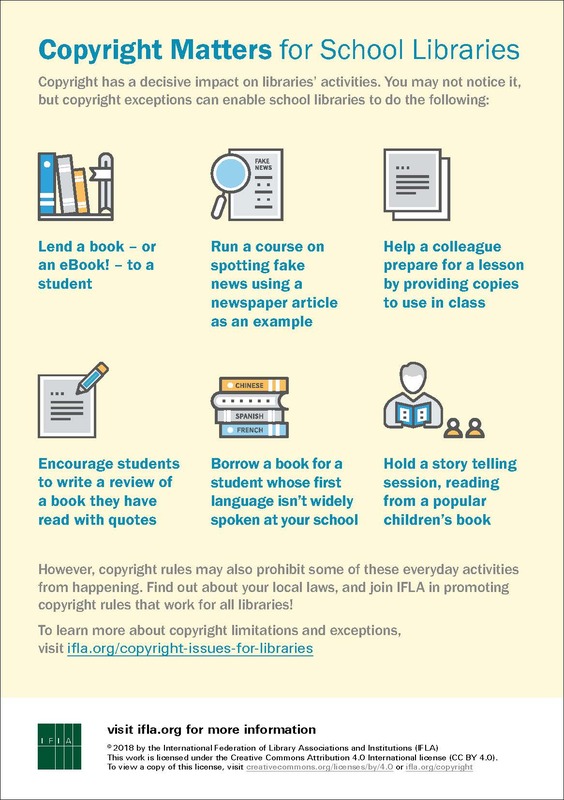 Download our infographics about how the right copyright rules for libraries support creativity, innovation, and communities, as well as about why copyright matters for public and school libraries.